Symbios Technologies is a privately-held startup technology company developing world-leading dynamic aqueous plasma technology platforms for water treatment, specialty manufacturing, and biotherapeutic applications. Our leadership team and Business & Scientific Advisory Board are seasoned experts with deep industry experience in water, wastewater, energy, finance, business, engineering, and plasma technology. Strengthened by initial technology development and vetting—performed at a combination of institutions, such as the University of Wisconsin, Colorado State University, and the U.S. Naval Research Laboratory, and by its intellectual property portfolio—Symbios Technologies is commercializing its disruptive advanced low-cost aqueous plasma oxidation technology, the Symbios Tubular Plasma Reactor™ (TPR™), to clean water, preserve the environment, and protect human health as well as improve production economics and sustainability. 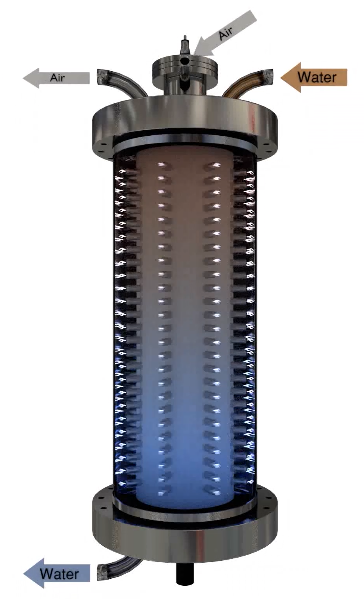 Symbios Technologies’ modular reactor is low in capital cost, able to replace existing energy-hungry or poor-performing advanced oxidation processes, reduce or eliminate the use of biocides, reduce or eliminate chemical additives, and reduce the overall maintenance cost of water treatment systems, in particular extending the life and reducing fouling of membranes. The resulting operating cost of the Symbios system is as low as one nineteenth of the cost compared to competitive options. The TPR4000™ is a low-power, plasma-based advanced oxidation technology. The unique design of the TPR combines a continuous-mixing mechanism with an air-enhanced plasma discharge system. Contaminated liquid enters from the top into the treatment chamber and is turbulently mixed and constantly exposed to the plasma nozzles. A low voltage is applied across the plasma nozzle and the discharge area while the plasma nozzle spindle continuously rotates and discharges under the support of air. The resulting plasma oxidation products are purged out of the chamber into the air as trace amounts of carbon dioxide (CO2). Testing has shown that the plasma generated in this reactor has the ability to simultaneously treat all major pollutant categories – pesticides, organic pollutants, PPCPs, and pathogens – without the need for any additional chemicals and without the formation of toxic byproducts.